1 SEASON ground beef with salt and pepper if desired. Heat large deep nonstick skillet over medium-high heat and cook ground beef and onion until beef is browned and onion is tender, about 5 minutes. 2 STIR in cocoa, chili powder, garlic and cinnamon and cook, stirring, until beef is coated and mixture is fragrant, about 30 seconds. Stir in water and tomato sauce and bring to a boil over medium-high heat. 3 STIR in Knorr® Rice Sides™ - Beef flavor; reduce heat and simmer covered until rice is tender, about 7 minutes. Let stand 3 minutes before serving. 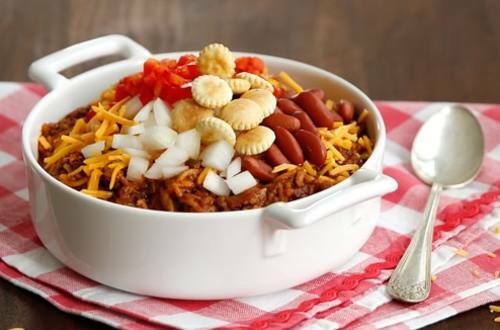 Serve, if desired, with kidney beans, shredded cheddar cheese, chopped onion, finely chopped red pepper and oyster crackers.